A number of variations of the tomato juice diet can be found on the Internet, but the basic premise is the same for all of them. 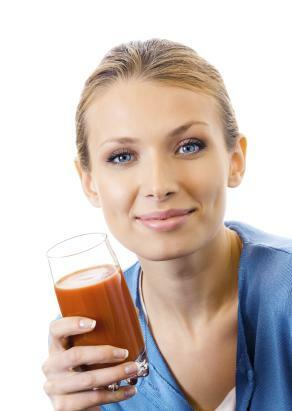 It is a liquid cleansing diet that uses tomato juice as a meal replacement. Other than these few items, no solid foods are allowed and bottled tomato juice is not recommended due to additives like sugar. Once you've completed the fast, whether you follow it for three days or all ten days, it is important to introduce solid food back into the diet gradually. As you do this, take time to savor and enjoy each sip and bite as you reintroduce different flavors into your diet. If you make healthy choices when you first start to eat solid foods again, you increase your chances of continuing to make healthier choices. If you gravitate toward the junk food you've missed, you'll increase the chance of gaining back the weight you lost quickly. Day 1: Drink liquids only but include juices like apple, cranberry and orange. Day 2: Stick with liquids and add a vegetable or broth-based soup. Day 3: Eat as on day two, but add crackers, fruit smoothie and raw vegetables. By the fourth day, if you're feeling fine, you should be able to eat solid foods again. Due to the lack of fiber intake on this diet, constipation can be a problem. People complain about hunger and dizziness on this diet. This is a short-term diet that is not to be followed for longer than ten days. This diet is not a solution for long-term weight loss because it doesn't establish lifestyle changes to maintain weight loss. Once solid food is eaten again, it is not unlikely that any weight lost will be re-gained. Limiting nutrients to one food lacks the balanced nutrition found when eating a varied diet that includes: lean proteins, whole grains, fruits and vegetables. Following the diet's initial weight loss, it is not unusual for dieters to gain back more weight than what they lost due to binge eating resulting from deprivation of solid foods. Before you decide to follow this or any juice diet or cleanse, talk to your doctor first. Diets such as this one pose health risks for people who have diabetes or other chronic conditions, and the tomato juice diet is not recommended for people who are pregnant or breastfeeding. Your doctor knows your medical history and will be able to guide you in making the right nutritional choices for your health and weight loss.